What if you could convince people to help you doing your research on their spare time? What if you could convince a million people to contribute to a specific scientific effort without the need of recruiting them yourself? Even better if you can get all these exo-collaborators without making a huge dent in your budget, which sometimes is just impossible even if you are willing to do it. The world is an interconnected global one these days; millions of voices sound through the web which makes it hard for yours to stand out. As an interconnected entity, communicating to a large mass has become feasible but it comes with a price: you need to be attractive! That’s right, you can get a million people to help your scientific efforts, its called crowdsourcing (think about wikipedia for instance), but you have to make it rewarding in some way, and since you are trying to convince them to work for you in their free time you have to make it look like something they’d do on that free time; So why not making it a video game? There are nowadays some serious games which are nothing more than an internet-based platform in which tons of data are loaded and accessed by many users who analyze them while being scored on their achievements in many different ways according to the rules of each game. Remember that famous NASA screensaver (SETI@home) which used the idle time on your computer to crunch data from the SETI (Search for Extraterrestrial Intelligence) project; that is a more passive example of exo-collaboration simply called distributed computing, since the user has to do nothing but allowing the entrance of data into their computers for further processing. Fold.it is a videogame (that actually began as a distributed computing screensaver called Rosetta@home) that allows you to play around with a protein and fold it in many different ways while you score points according to the conformer’s plausibility. Obtaining the native tertiary (and even the secondary) structure of a protein from no other information than the primary structure is extremely difficult given the enormous amount of available degrees of freedom. Molecular dynamics alone is unable to predict the native tertiary structure of the protein; the number p of possible disulfide bonds present in a protein is p = n!/[(n/2)!2^n/2] where n is the number of cysteine residues available, plus computers know nothing about proteins or enzymatic catalysis so a hand from us fellow humans and our chemical insight is widely needed. Therefore our previous knowledge of chemistry, biochemistry and the nature of related proteins can help us help those programs in finding the best possible answer to ‘how does this protein look like in 3D space?’ but since this human-helped process is slow and cumbersome you need thousands of people working on it a great deal of time; almost as if every person playing with the same structure was a single core in your computer. 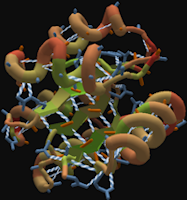 Fold.it thus, is a sort of protein self docking, if you will, in which players are ranked according to their skills and rewarded according to how well your structure complies with three simple rules: 1) lack of voids (packing) 2) keeping the orange hydrophobic chains unexposed to the aqueous exterior and 3) avoiding clashes. Scoring functions for these three concepts are calculated and then yield a score for the player which is then ranked to other players folding the same protein (or to other players in their overall performance). Fold.it has already collected some major success stories such as the one published on Nature Structural & Molecular Biology by David Baker (founder of Fold.it) et al. on September 2011 (doi:10.1038/nsmb.2119) in which players helped in solving the crystal structure of a protease from a retrovirus which causes AIDS in monkeys. The determination of this structure had already taken 15 years of work with only partial success; but the data was available in Fold.it for only three weeks when the appropriate match to the diffraction experiments was found! This case alone has stirred too much attention and for a beautifully written piece about it, you can check this article at the Discover Magazine by Ed Yong. Other such examples of crowdsourcing in scince, more specifically in astronomy, are Galaxy Zoo and Moon Zoo in which thousands of images from the Hubble telescope and numerous moon probes are made available for users to sort and classify. The aim of Moon Zoo is to study the amount, shape and occurrence of craters, which basically never erode unlike those on Earth. This analysis will let us know more about the origin of our natural satellite and ultimately about the origins of our solar system. To the participants in this specific kind of scientific crowdsourcing the term Citizen Science is applied and even publications such as the Scientific American magazine host a section where you can call out for volunteers in your projects. Some sort of classified ads for the lonely scientists in their labs in search for “idle” hands that can make a significant contribution to science. Some Citizen Science projects are intended for kids and teenagers as a way to get more people interested in scientific disciplines by engaging them directly in activities with a measurable progress of their own contributions. It is worth mentioning that projects like Fold.it, Moon Zoo and Galaxy Zoo are developed in a way that can be used by people with no expertise in the field in order to recruit as many people as possible just to perform a very specific task, proving thus that the human brain is a powerful and beautiful machine whose insight isn’t equaled by any artificial system, yet. Well, it is now time to go back to work before I’m deemed a permanent exo-collaborator by my bosses. Just a final thought: What were our mothers saying about us playing too much with our video games? As usual please share your thoughts in the comments section, rate this post and let me know that you are out there reading this.